Our Pro-Lite Type 3 layflat high pressure fire hose is a general purpose all synthetic heavy duty layflat delivery hose complying with BS 6391 Type 3 international standards. The hose is a high quality Nitrile-synthetic rubber extruded through the weave giving a ‘Unified’ construction. With a smooth external cover it is the lightest Type 3 hose making it very agile and flexible. This hose requires no drying after use. The Pro-Lite high pressure fire hose is characterised by its heavy duty, high abrasion resistance and extremely long service life. Flexible and kink resistant structure produced with very low twist and small coil diameter. It is a multipurpose hose suitable for a wide range of applications. 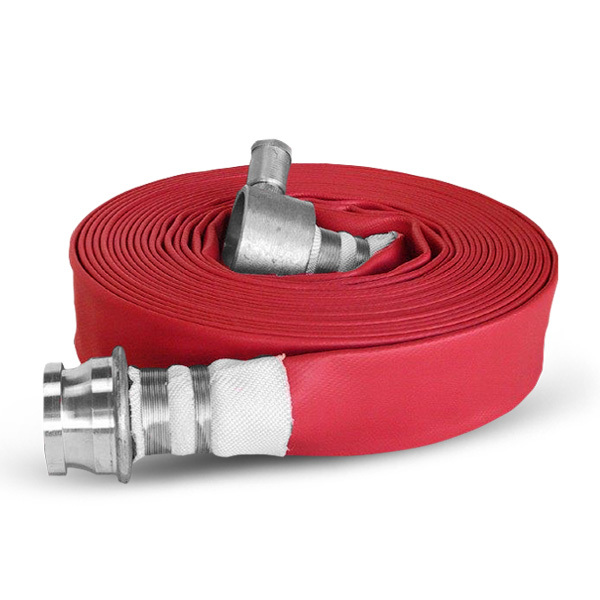 The Pro-Lite Type 3 layflat high pressure fire hose is principally used in the firefighting industry and is a very popular option in the construction industry. However it is a multipurpose hose also commonly used within the shipboard and marine industry, on refineries, in agriculture and irrigation, general industrial use and for all wash-down applications. It Complies with BS 3691 Type 3 (50 bar) International Standards and many others.